Heteropoly Acids｜JAPAN NEW METALS CO., LTD.
Heteropoly acids are condensed products which consist of inorganic oxyacids of phosphorus, silicon, etc. and that of tungsten, Molybdeum and Vanadium, etc. They are crystals which have keggin structure and strong acidity and oxydation power. 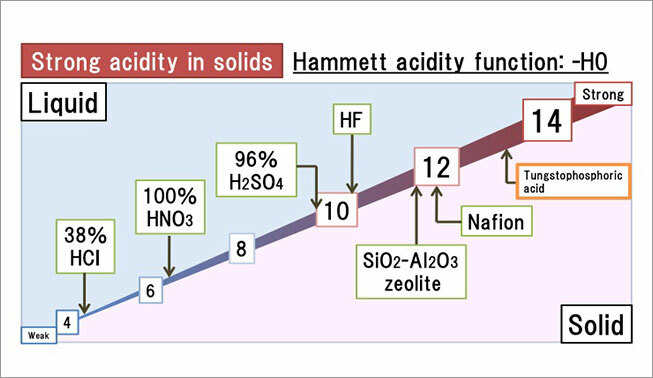 Japan New Metals can provide a wide range of high-purity heteropoly acids with stable quality by newly developed manufacturing system comprising effecient mass production facilities and superior qualitycontrol management. Heteropoly acids are widely used for materials of catalysts in the chemical industry. They show strong acidity in both condition of solid and liquid. For example, the concentrated solutions of them have higher aicidity than perchloric acid (HClO4) or sulfuric acid (H2SO4). Tungstic heteropoly acids are more advantageous to acid catalysts. In homogeneous reaction these catalysts are applicable to hydration, transetherification and polymerization. Moreover they are used for dehydration, etherification and esterification as solid heterogeneous catalyzed reaction. Molybdic heteropoly acids and Mo-based heteropoly acids coordinate bonded with vanadium or tungsten have not only strong acidity but stong oxidation power, are the common catalysts for oxidative reaction. These solid acid catalysts are typically applied to the manufacturing of methacrylic acid by gas phase oxidation of methacrolein.